Since we’re good friends by now…I thought cozying up to a fireplace together would be fun this week. Rudolph with a present on top just cried out for it with that sweet sentiment. Grab a cup of something warm to drink and settle in to watch the video below or click HERE to see it in HD on YouTube. 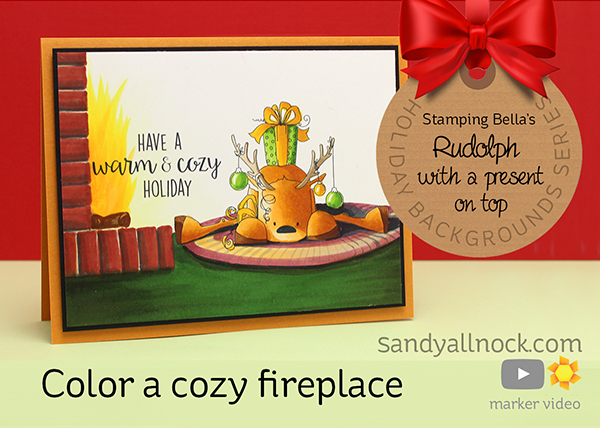 One final giveaway is posted over on my blog – if you’d like to try coloring this cozy card, go leave a comment to qualify to win, and I’ll announce a winner on Sunday! If you’re interested in seeing more Holiday Backgrounds, be sure to follow my blog or YouTube to have them delivered to your inbox throughout the fall! Wow I’ve no words to describe how cute is this card I also love so much Christmas and I think that this reindeer will be so beautiful on my Christmas cards! At first when I glance at the card, I thought he was a fish on a platter. LOL See me thumping my head? But then I began to see all the elements of the card. The fireplace is outstanding! I love the rug! Such a nice scene. Thanks so much for doing the background lessons. They really are inspiring! Now, I can’t leave the background’s plain! Excellent card. This series is wonderful! Thank you. Thinking of a throw rug? I love the card and the background!! He’s adorable and I don’t think the fire is a danger to him, he’ll be fine 🙂 Love this serious, they are so educational for us, thanks for all you do for us!! Thank you! !